After a long, long break I have finally found the time to do some work on my site. 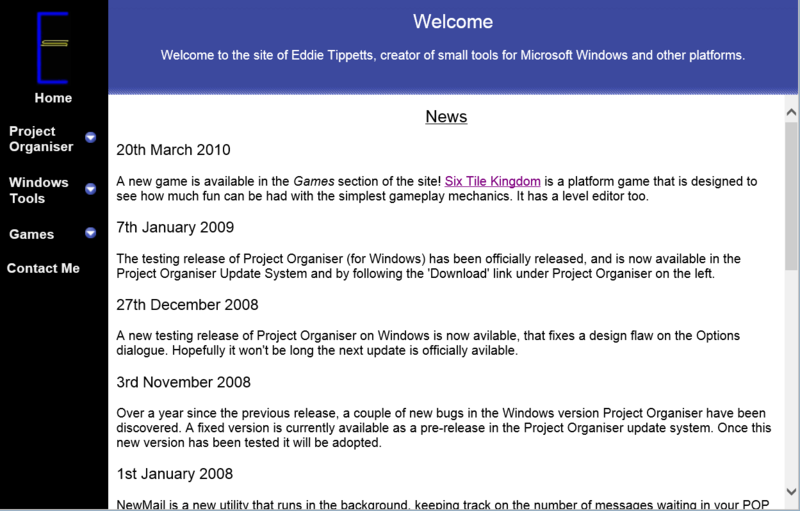 The existing site format was simply old, so I went back to basics and did a new design with a new engine to build it. Old. Written with techniques that were the rage in the very early 00's, it was a testament to backward compatibility that it still rendered correctly †. Most of the tools I distributed are thoroughly outdated, but for posterity are still avilable. They're tiny, so why not? A utility aimed at helping students to keep track of their assignments. This came in three versions, for Windows, and the poor-cousin Mac and Java editions. This is a basic graphical database design and create-script generation tool. It is available for Windows here. Asteroids - yes, that game, sans scoring system. Six Tile Kingdom - a deliberately simple platformer. Shutdown Timer - lets you schedule a shut down ahead of time. Spare Screen - re-purposes the scroll lock key to provide a virtual second screen onto which windows can be placed and kept out of the way. File Explorer - a very basic replacement for Windows Explorer, to work around the absurd situations where the genuine article is not available. File Finder - a very basic file search tool. † Of course, it only rendered with nice collapsing menus when IE5-7 quirks were enabled.